If you are a gym-goer, then you must be familiar with power racks. Generally, this is one of the pieces of gym equipment that people stick with most. That’s the reason why it’s not rare for you to see them in both home gym and commercial gym. Today, I’ll explain why this piece of exercise equipment can take your own gym to a higher level. And at the end of the article, I’ll show you how to choose the best power rack for your gym. 1. Do You Have Enough Space For It? 2. 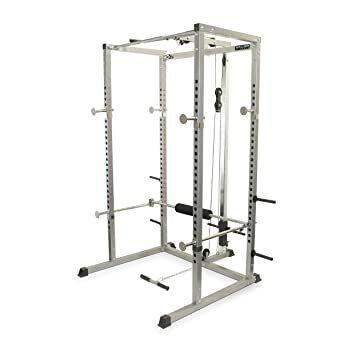 Can You Add Other Sorts Of Equipment To The Rack? 3. Which Is The Best Size For You? 4. Is The Rack Easy To Use And Adjust? 5. Can You Anchor The Rack To The Floor? 6. Does The Rack Feature A Stabilizer? First, let’s get started with the definition of the power rack. Generally, a power rack is a piece of gym equipment designed for maximum safety while you’re lifting heavy. In my opinion, it looks like an old-fashioned telephone booth. With this device, the barbell is enclosed (full rack) or used on the front of the rack only (half rack). It allows you to train with free weights without requiring a spotter. There are also pin/pipe safeties which will catch the barbell in case it slips. They also feature pin/pipe safeties, plate storage posts, and built-in pull-up bars, some models even have dip bars. That means it’s possible for you to do a wide range of exercises. Basically, you can’t find a piece of gym equipment which provides a safe complete body workout like a power rack. It is customizable with built-in safety. More specifically, it features safety pins on both sides of the cage that you can easily set to your own requirements. That’s why you can get the peace of mind and be more confident to lift heavier weights. These safety pins will stop the downward movement of the barbell in order to prevent injuries during your heavy lifts. For example, if you accidentally lose your grip on the bar when performing the last front squat rep, these pins will definitely save your back. Therefore, along with gears like weight lifting belts and knee sleeves, a power rack can make your squat much safer and more joint-friendly than ever. As for squats, let’s face it, it’s impossible for you to build overall strength as well as muscle mass without a power rack or squat rack. Believe me, no one can get the 300 lb bar in position for the squat without a power rack no matter how strong he is. Of course, with deadlifts, this may not be true but that’s another story. In short, using a power rack helps prevent a lot of serious injuries and it also gives you the best platform to do compound movements with ease. A lot of people think that a power rack is only designed for certain exercises. But that is completely wrong because you can totally use this equipment in many different ways. For example, I’ve seen my experienced gym buddies even use it to enhance their Crossfit training with resistance bands. Furthermore, in addition to the squat, you can also do a lot of compound movements. For instance, you can do pull-ups, bench, barbell rows, barbell shrugs, hanging leg raise and so on. Have you ever mistaken a power rack for a squat rack before? Well, actually, to a certain degree, these 2 devices are interchangeable as you can do the squat and bench press with both of them, right? However, on the whole, there are still big differences between a power rack and a squat rack. As its name suggests, a squat rack or a squat stand is mainly designed for the squat movement. And the main difference is that it only consists of 2 adjustable stands supporting the barbell while a power rack has 4. Hence, it’s more space saving and much more mobile than a power rack. But that also means a squat rack is not as safe as a power rack. So if you don’t have a spotter, this is not a good choice for you. Additionally, unlike a power rack, a squat rack has no plate storage post or pull up bar. And even if you have some additional options such as resistance bands or a lat machine, you can’t add it to the squat rack. From the chart above, a power rack is a better choice for your training. Maybe a power rack itself more expensive than a squat rack but if you look at the big picture, you’ll see that it is not that expensive. Why? This is because you don’t have to pay any extra money or waste a lot more space because of other machines. Be honest, do you really want to spend $100 for your gym just to do the squat movement? In order to determine if there is enough space, you need to measure the power rack you want to buy first. In case you order it online, just make sure you check the dimensions carefully in the product description. After that, measure your floor space to know whether the rack can fit there. Remember to measure the height of your room up to the ceiling as well. This is because a power rack is not only large but also tall. If the ceiling is not high enough or there isn’t enough room for your head to fit above the rack when you do pull-ups, then don’t choose it. You don’t want to buy a whole power rack just for the squat, don’t you? Buying a rack is one big thing, but you also have to think about the other equipment that can go along with it. As you can see, when it comes to power racks, a barbell and a bench are the 2 most common things you need for your workouts. Hence, it’s important to make sure you have enough space not only for the rack but also for the accessories. To do that, just imagine how you will use all the equipment and make sure nothing can get in your way. Apart from space, you also need to consider the rack. Some people even add a weight stack for the lat pulldown to their racks. However, you cannot do that if the rack doesn’t allow you or it’s not rigid enough. In short, it’s best to buy a rack that includes all the accessories you need before making a purchase. This is not a really important thing but you still need to consider this. If you are a man who is over’s 6’3’’ or a woman who is under 5’5’’, then the correct size will be a bit different. Just read all the information about the rack so you won’t end up buying one that is either too big or too small. Look at all the dimensions so you can buy one that can be large enough. Of course, the narrower and shorter a rack is, the less it cost. However, do not let the price of a rack be an important consideration when you determine the correct size for yourself. Before you buy a rack, make certain that you know exactly how to use and adjust it. Some models come with a safety system using pins, and for some lifters, these pins are not really easy to adjust. My advice is to read all the reviews online. Actually, this is the best way to see what the real users feel when using it. This is another factor you should consider to buy the best power rack. If you want to do pull ups or chin ups, then your rack should be one that you can anchor to the floor. But unfortunately, not every unit has this feature so it’s necessary to decide how you will use it before making a purchase. As mentioned above, some models need to be anchored to the floor and some others come with a stabilizer bar. This bar can be very annoying at times since it may be in your way and sometimes even cause injuries. Therefore, look to see whether the rack you want to buy has a stabilizer bar or not. Then figure out yourself whether you need that stabilizer? In my experience, you shouldn’t choose a rack that comes with unremovable stabilizer bar. Also, if the bar is not at least flush to the floor, then don’t go for the unit. With a 2”x2” square steel frame and 800-pound max weight capacity, this full power rack is one of the best choices for your budget. For maximum safety, a pair of rear lock-in stabilizer bars works as a self-spotting system. Therefore, this power rack is very stable and you don’t have to worry about it shaking while training with heavy weights. This unit provides you large walk-in space so that it is very easy for you to do any side-to-side movements. 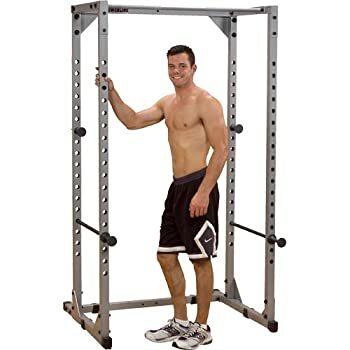 Additionally, this Fitness Reality power rack features 2 23-inch chrome safety pins which have 19 adjustable height levels. These pins will help you lift heavy weights without needing a spotter, especially in heavy lifts such as the squat and row. Furthermore, the rack comes with multi-position overhead pull up/chin up bars which allow for a wide range of exercises. The downside of this product is that it doesn’t include barbells and weight plates so you have to buy them separately. This is one of the most solid racks available on the market so it can last for a very long time. Basically, this rack looks like the previous one. This one is comfortably large with the dimensions of 49″L x 46″W x 82″H. Therefore, it can easily accommodate lifters of varying physique. Just like most other units, you can use this PowerLine power rack as a multi-purpose gym device. For instance, you can do squats, flat bench and pull up as well. I believe that if you have a weight bench and a barbell, you don’t have to buy anything else to do a full body workout. What I like about this rack is that it comes with a 10-year frame warranty that speaks volumes about the durability as well as reliability. Additionally, with 2 heat-tempered liftoffs and saber-style safety pins, your workout is very safe. My impression of this power rack is that it is huge with a 12-gauge steel frame which provides great durability. Additionally, it features 4 plate storage posts which are about 8 inches long so you can store weights instead of leaving them on the floor. For me, this feature especially benefits serious lifters who believe in heavy weight training. However, it comes with all the amenities you need for your training. 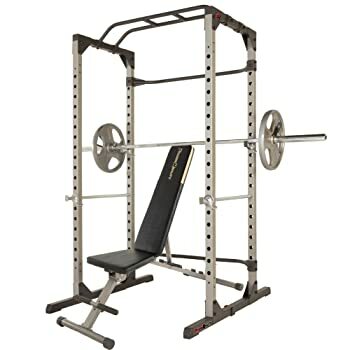 Unlike most other units, this power rack features lat pulldown attachment along with a solid steel chrome pull-up bar. Furthermore, the device has a low pulley station for seated rows and biceps curls. In short, with this one you can do a wide range of movements such as squats, lat pull down, pull up, curls and so on. As compared to most other models in the market, this one is much bigger and heavier. But that’s also the reason why it is more durable and rigid. In details, the lat pull station can handle up to 250 lbs and if the maximum weight capacity is 800 lbs. Now, have you found the best power rack for your training yet? As you can see from reviews above, the winner is Fitness Reality power rack. It’s not the most versatile one but considering the price, it can be the best power rack available in the market. However, if budget is not a major consideration, then you can purchase the Valor Athletics Power Rack. This is because it allows you to do a lot more exercises than you can with most other units.